Get ready for thrilling enchantments and dark mysteries in Awakening: The Dreamless Castle iPhone app distributed by casual gaming powerhouse Big Fish Games. A lush, gorgeously illustrated fantasy, this lovely hidden object game is a surprisingly polished and satisfying take on the genre for the iPhone and iPod Touch. As befits a fairy tale theme, you are a beautiful princess who has just woken up in a mysterious castle. You have no idea who you are or how you got here, but it is up to you and your smarts to figure out how to lift the enchantments surrounding the castle. Along the way you encounter fairies friends and goblin guides as you gradually unlock the puzzles surrounding your extraordinary surroundings. Admittedly, it’s not exactly the most macho plot around, but challenges are open to all genders. Like most games of this type, Awakening is a combination of seek-and-find, simple mini-games, and puzzles. The hidden object portion is perhaps the most impressive part of this game, as each scene is beautifully illustrated with lots of detail and a surprising amount of realism. Items aren’t just thrown willy-nilly across a backdrop; everything actually looks like it belongs there, more or less, although the castle is somewhat more cluttered than you might expect. And the large number of scenes help make for a gorgeously immersive environment. The mini-games and puzzles were also delightfully robust. While some were certainly more challenging than others, I was really pleased by the variety and general polish of the mini-games. They were nicely appropriate to the theme and felt like a key component to the game instead of the more usual bland afterthought. Mahjong solitaire lovers will especially be pleased by Goblinjong, which you can also unlock as a standalone mini-game once you’ve completed the main storyline. Unfortunately, a few of the puzzles required a lot of back and forth navigation to pick up all the relevant items. It wasn’t horrible, but it did feel a little inefficient and tedious at times. Occasionally it was also easy to overlook small, but important details, and the hint system, while generous, wasn’t always terribly functional. I found myself resorting to an online walkthrough more than once when the in-game hint system left me hanging. Despite these flaws, I actually really enjoyed the game. It is one of the best examples of the genre available in the App Store, but it is somewhat short (I finished in a few hours), and the replay value is minimal if you’re not a big mahjong fan. Even so, Awakening is easily one of the most attractive hidden object games around. Only the iPad version comes with HD graphics, but even the iPhone version is bursting with a ton of gorgeous detail. The overall polish is pretty phenomenal for a game of this type, with nice menus, in-game achievements, minimal, but smooth voice acting, and just a lot of pretty, pretty scenery. It’s a tad pricey and not particularly original, but still worth a peek all the same. 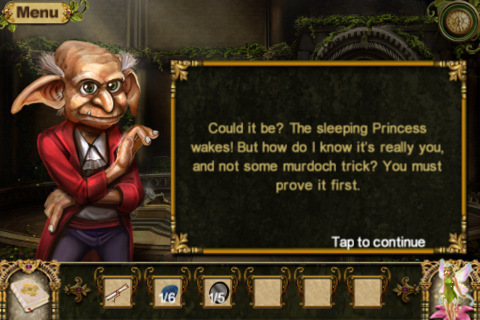 AppSafari review of Awakening: The Dreamless Castle was written by Tracy Yonemoto on June 2nd, 2011 and categorized under Adventure, App Store, Games, Mini Games, Puzzler. Page viewed 4922 times, 1 so far today. Need help on using these apps? Please read the Help Page.